Well, we just gt quite the rainstorm and at an only 30% chance. Weird but I will take it. I just got some plants in yesterday so this is great. Today's image is of a Blue Jay with a bug snack. 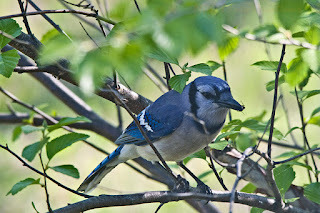 We have a River Birch in the front yard that the birds like to sit in now and then and I was able to capture this Jay a few days ago. I was surprised when I saw the snack in it's beak while looking at the photo on my computer.